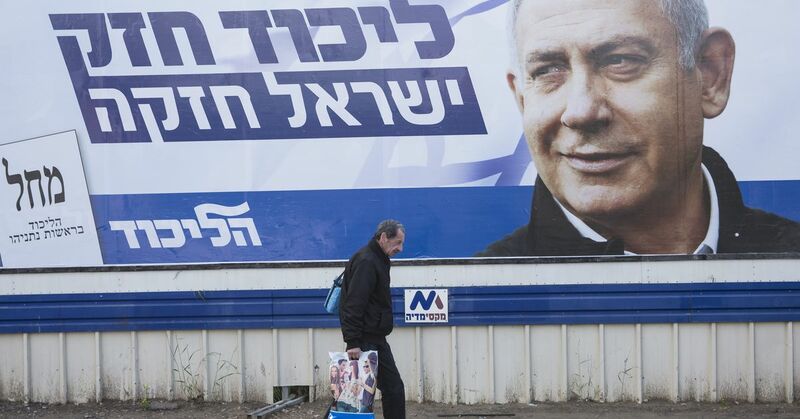 Israelis head to the polls Tuesday in what could be the most consequential election in decades. Right-wing Prime Minister Benjamin "Bibi" Netanyahu, who has spent a total of 13 years in power, is seeking his fourth consecutive term. It's one of the toughest election fights he has ever encountered. Netanyahu is facing possible indictment by Israel's attorney general on fraud and corruption charges, and is also going up against a particularly formidable opponent: Benny Gantz, a centrist form of military chief whose impressive national security credentials are directly threatened by Netanyahu's grip on power. 1; including making the decision to formally recognize Israel's sovereignty over the disputed Golan Heights. ] But the prime minister seems to be worried that power could slip from his grass and polls suggest he has a right to be. On Saturday, what was seen as a dramatic, last-minute attempt to energize and thus tip the scales in his favor, Netanyahu announced that if elected, he would annex large parts of the West Bank. Officially extending Israeli sovereignty over Jewish settlements in the West Bank, which has long been seen as a critical part of any future Palestinian state, would effectively spell the end of the dwindling hopes of one day achieving peace and creating a real, functional state for Palestinians. It's anyone's guess whether Netanyahu's brash move will be enough to get him over the top – and given the peculiarities of Israel's parliamentary system, even if his Likud party wins a majority in Tuesday's election, it's not a guarantee that he will be able to form a coalition government and stay in power. With so much at stake in this election, all eyes will be on Israel. Here's the key issues you need to know so you can follow along. Netanyahu is headed into this election plagued by multiple corruption scandals that just won't seem to go away. Over the past year, the 69-year-old prime minister has been the focus of three investigations into allegations that he doled out political favors in exchange for positive news coverage and committed fraud, among other things. In late February, Israel's attorney general announced that he intended to charge the prime minister for crimes related to corruption, pending a hearing. This puts a lot of pressure on Netanyahu and his party performs at the polls, because if he manages to retain his position as prime minister, there's a chance he can pass a law that would basically protect him from being put on trial. "He's desperate to avoid criminal prosecution," Ilan Goldenberg, who was directly involved in the Middle East Security Program at the New American Security think tank in Washington, told me. But while some voters are surely put off at the corruption allegations, many Israelis still see Netanyahu as the right candidate for the job. Israel's economy has prospered in the past decade, and Netanyahu is seen as being tough on Iran, a country Israeli existential threat. Many view Netanyahu's close relationship with Trump as another point in his favor. The US president's decision to recognize Jerusalem as Israel's capital, the decision to hand over Israel to the Golan Heights, and Trump's much harder line toward Iran has all reflected on Netanyahu. In another election year, these examples may have been enough to easily counteract stubborn corruption allegations – but it may not be so simple this year. Netanyahu is also facing a particularly compelling opponent. Netanyahu is up against Benny Gantz, a 59-year-old retired general who from 2011 to 2015 served as the Israel Defense Forces (IDF) chief of staff – the supreme commander of the entire Israeli military and its highest-ranked officer. Gantz is new to Israeli politics, and has been described as calm, cool, and soft-ghosts. He was reportedly the role of Israel's defense minister before polls showed that he was an extremely popular choice for prime minister prior to him even entering the political arena. The former military officer has painted himself as a political outsider who would be a breath of fresh air. He's talked about "uniting" Israel and refocusing on democracy. He has taken aim at Netanyahu by saying he'll fight corruption and impose term limits. But it doesn't differ much from Netanyahu in other areas, like its policy on the Palestinians. He's also allied with some extremely political politicians in the Knesset. In short, some say, is trying to be all things to all people – but mainly offer an alternative to the prime minister prime minister. Netanyahu, for his part, has had a lot of success partly by portraying himself as tough on security issues, like his policy toward Iran, and his forceful response to rocket attacks from Gaza. In past elections, it has served him well. But it is ultimately facing off against someone, so it can easily be painted as weak on security – though he's probably trying. A pray to win support from Israel's father right, Netanyahu declared over the weekend that he would “extend sovereignty” to the roughly 130 Jewish settlement blocks in the West Bank if he's reelected. The West Bank is a section or country east of Israel that's home to about 2.6 million Palestinians. As Vox's Zack Beauchamp writes, "Israel took control of it in 1967 and has allowed Jewish settlers to move in, but Palestinians (and most of the international community) consider it illegally occupied Palestinian land." Today, about 622,000 Jewish settlers now live in the West Bank, an enclave that ranges from sizable cities with middle-class villas to small encampments. The West Bank would probably form the basis of a future Palestinian state in any two-state solution to the Israeli-Palestinian conflict – a plan that Netanyahu and past US administrations have endorsed. But Netanyahu's promise to start annexing the region would change things significantly. One reason is that these are spread out across the West Bank. So if they become official territory of the state of Israel, leaving the country left for a future Palestinian state looking at a piece of Swiss cheese – a bunch of disconnected pieces of territory with sovereign Israeli land dotted throughout. That's hardly conducive to forming a coherent, sovereign state where Palestinians can one day live in peace. And that's exactly the point: By annexing these settlements, rather than treating them (at least on paper) as illegal outposts that will be one day dismantled, Netanyahu would essentially give a huge gift to the Israeli right . "It seems clear that he is making a bid for right-wing voters and especially the pro-settlement," The Greater Israel crowd that has been pushing for annexation for several years, "said Khaled Elgindy, a fellow at the Brookings Institution, a think tank in Washington, DC. "Such a move would probably signal the death knell of the two-state solution, and move Israel closer to a formal apartheid reality on the ground." This group – many of whom prefer to be called Palestinians in Israel, or Palestinian citizens of Israel – make up about one-fifth of the Israeli electorate. They include Muslims, Christians, and Druze (a religious minority). Many are Israeli frustrated and disillusioned with the political process, and point to decades of systemic discrimination against them. Buttu especially pointed to a law that changed the year before the 2015 election that requires political parties receive 3.25 percent of total votes cast in order to meet the electoral threshold to join the Knesset (Israel's parliament). That law, Buttu said, has made it difficult for some minority groups to be properly represented. According to recent polls, only about 50 percent of this group said they planned to vote, and there have been calls to boycott the election. In recent weeks, though, some prominent figures have spoken out to emphasize the importance of participating in the political process, however flawed. Palestinian rapper Tamer Nafar even made a music video encouraging Arabs in Israel to fight racism by making their voices heard at the ballot box. "If our vote will … imprison Bibi, then we're ready," he says. If you do, it could be a game changer, since they could provide enough support to Gantz's bloc that he edges out Netanyahu, Haaretz reports. If they decide not to participate, though, Netanyahu has a better chance of winning. [Netanyahu] Netanyahu has been running a distinctly anti-Arab campaign – even more so than in previous elections He recently joined with the openly racist previously banned ultra-right-wing Jewish Power party, which earned him rare criticism from AIPAC and other pro-Israel groups. It's possible that frustration with Netanyahu's approach could inspire more Arabs in Israel to cast their ballots – and tip the scales away from the sitting prime minister. Israel's parliament, the Knesset, is composed of 120 seats. Israelis donate votes for individuals, but instead choose parties. There are dozens of parties competing to win spots in the Knesset, but Likud (headed by Netanyahu) and the Blue and White party (headed by Gantz) have the most support for father. However, because no party has ever won Gantz and Netanyahu's parties have almost all of the smaller parties to form a coalition that would allow each of them to govern. There's also another complicating factor: The leader of the party with the most votes doesn't just become the next prime minister; Israel's president (who is elected to a seven-year term by an absolute majority in the Knesset) ultimately decides who form the next government. Israeli President Reuven Rivlin will consult with the leaders of the winning parties and make a decision about who should be the next prime minister. That process could take about a week. The party leader who is elected will then have six weeks to form a governing coalition. If they fail, another party leader takes over. In short, there are lots of scenarios that could play out on Tuesday. Which makes this election a nail-biter – one that could have ramifications for decades to come.